I’ve always been a hat guy. 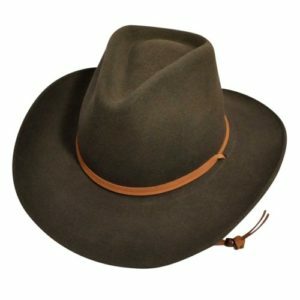 From ball caps to fedoras to backpacking and hiking lids that resemble cowboy hats; there’s a million and one uses for them. If you’re an outdoor nut like me – you know how important headwear can be while trekking through the wilderness or even your own backyard. Looking through old photos of outdoorsmen, you will see 9 times out of 10, they wore an iconic hat. Obviously, they were more for function than looks, but they became their own style that outdoorsmen today may be missing out on. 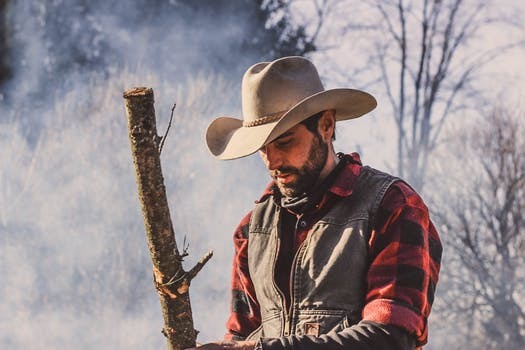 I wear brimmed hats when I throw knives, chop wood with an axe and while sitting around a nice campfire smoking a good stogie. I also use hats to get into character when writing and rehearsing acting roles. 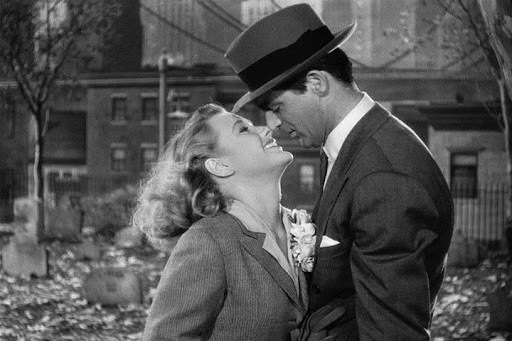 I wore a 1940’s style fedora for months as I rehearsed my role as Mortimer from Arsenic and Old Lace. When I realized the power wearing hats could have, I began wearing one every time I sat down to write. 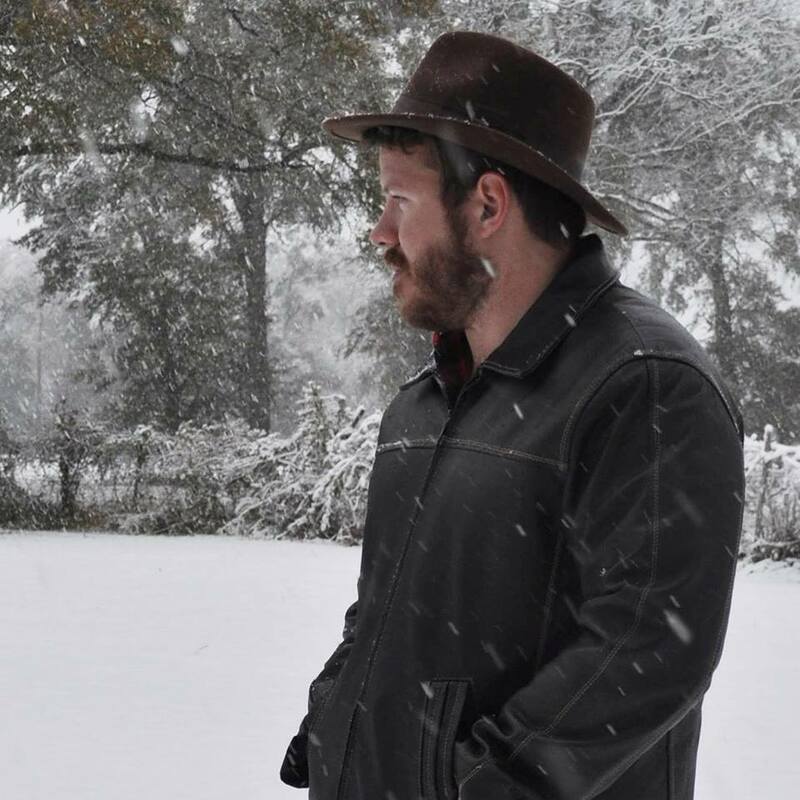 I’m currently working on a post-apocalyptic adventure while wearing a Lite Felt Cabela’s crushable hat that looks like a cross between Indiana Jones and a cowboy hat. I figure the lead character, James, would probably wear something similar. The act of putting the hat on gets me in the right state of mind to write this particular character, much like Sylvester Stallone in Over the Top – when he flipped his cap backwards, it was time to go to work! Other than creating a fashion statement, hats have a long history of functionality in the wilderness or even on a short hiking or backpacking trip. A quick search for hiking hats and backpacking hats will give you a ton of options. 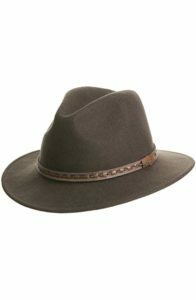 The type we’re talking about today aren’t just for hiking the trail, but are the workhorses of the hat world. They are usually brimmed hats made from wool that you can crush and stuff in your backpack. They may not be the lightest of materials, but that’s not exactly what you’re looking for in an outdoor hat anyway. These are the types of hats you’re going to wear on your next adventure. They are the perfect combination of rugged outdoors, functionality and style. I live in the Southern U.S. and it gets hot and muggy and stays that way for a long time. I wear a wide-brim hat that’s lightweight and crushable just in case. I prefer felt material – sure it gets hot on occasion, but the sweat seems to keep your head cool under the hat. If you spend a lot of hours in the open sun, you need coverage. I have a full head of hair, but I still wear hats when the sun is beating down overhead. A wide brim hat can cool your face down a few degrees and provide shade. OK, we don’t get snow here often, but the few times we were lucky enough, you better believe I pulled out the old felt outdoorsman hat! Perfect opportunity to break it in. I thought it was the coolest thing to run my gloves over the rim of the hat and knock off handfuls of snow! These things absorb water and can keep you head and shoulders dry. You need to invest in a quality hat if you live in an area that gets cold. This is especially true if you spend a lot of time outdoors or hiking. You lose most of your body heat through the top of your head and a quality outdoor hat can help you retain some of it. The one I’m currently wearing does that perfectly! Style may not be on your mind when choosing outdoor gear or supplies, but why not choose a style that you love! I personally wear my headwear all over town. 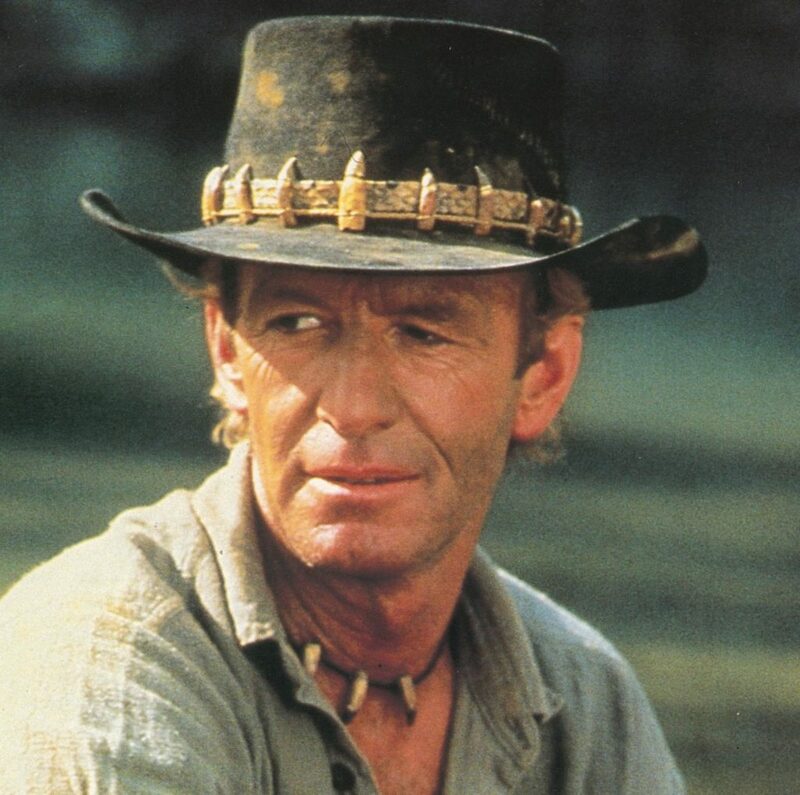 Sure, I may look like a cross between Crocodile Dundee and a cowboy, but who cares? I like the look and it’s always a conversation starter when you come across another man wearing a hat. 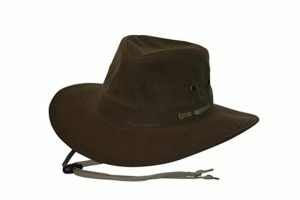 Rugged outdoorsman hats were made famous by such characters as Crocodile Dundee, Indiana Jones, Hopper from Stranger Things (my favorite hat) and droves of Australian outdoorsmen on TV. When you mention one of these character’s names, the first thing you remember is the hat. You have plenty of choices of material when choosing a rugged outdoorsman hat. Felt, cloth, straw and leather are a few of the more popular materials. Take your local climate into consideration when choosing. Like I said before, I reside in a hot and muggy climate, but I still choose felt for the majority of my hats. It’s packable, tough and easy to clean. You may want to go with leather though, depending on your budget. 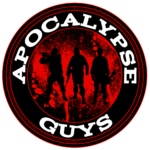 Here at ApocalypseGuys.com, we test out various outdoor gear and give you our unbiased opinion. Below you will find our top picks for rugged outdoorsman hats. Keep in mind there may be better options for you based on your needs, location and budget; these are just our favorites out of the many options for sale. Whew…what a name! Perfect combination of rugged looks coupled with functionality – the Wind River is 100% wool, packable, water repellent, fold away earflaps for cold weather and has a handsome leather hatband for extra points. This outdoorsman hat is stylish enough to wear around town, yet rugged enough for the campsite. The fact that it’s water repellant is a big plus! I can’t tell you how many times I’ve gotten caught out in the rain and gotten soaked before I could make it back to the truck. It also comes with a chinstrap. Never used it before, but it’s there if you need it. One thing that can be said about these felt, crushable hats is they retain their shape even if you abuse them. That’s handy for those of us that are rough on our outdoor and survival gear! The Holy Grail of hats! 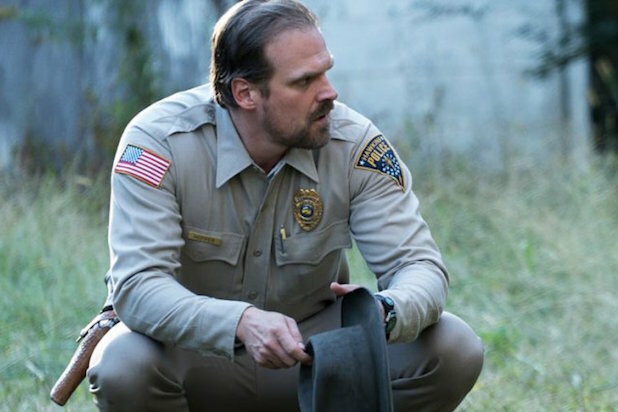 I wanted this outdoorsman hat since I first saw it on Stranger Things! 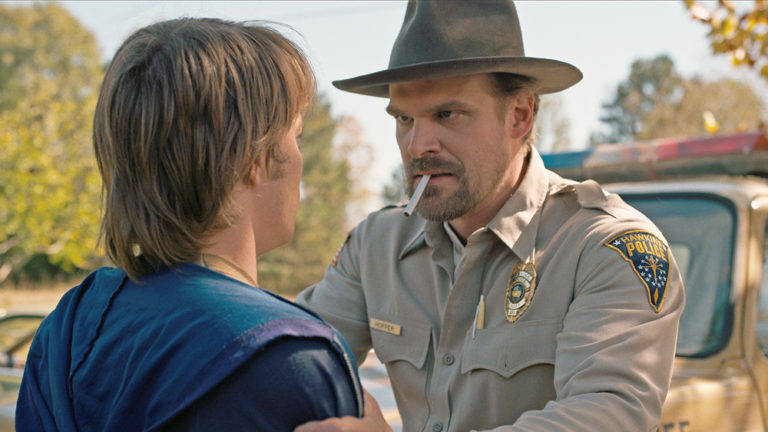 I was watching it with my family and I noticed the hat the moment I laid eyes on Chief Hopper played by David Harbour. Made from 100% Beaver Felt, this weather refined hat is tough! 3.5 inch tear drop crown and a 2 ¾ brim with a hand dyed invisible band; if you can get one of these, you’ll be the envy of… well, just about anywhere damn where you go! Only downside to this marvelous hat is it costs $675! Worth every penny, but may not be in everyone’s budget. Maybe it shouldn’t be on a list of frugal options, but I thought you may want to at least check it out. 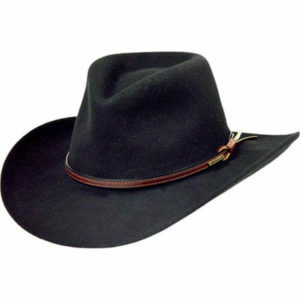 Fans of outdoorsman hats with a western look will enjoy this one! 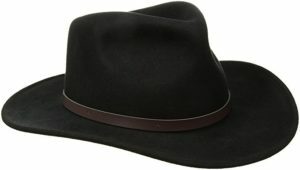 This is a great looking hat that slightly resembles John Marston’s hat from the game Red Dead Redemption. Many people buy this hat just because of the resemblance. Crushable and made from wool felt; this outdoorsman hat can serve you in both hot and cool climates. It has an adjustable hat band that can be removed if you don’t like it. The edges are more straight as opposed to rolled up. Personally, I like this hat as an everyday hat for kicking around town. 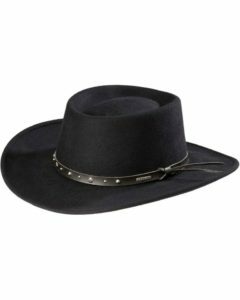 Crushable outdoorsman cowboy hat with leather hatband made from black and chestnut leather with 4” pinch front crown and 3 1/4” brim. 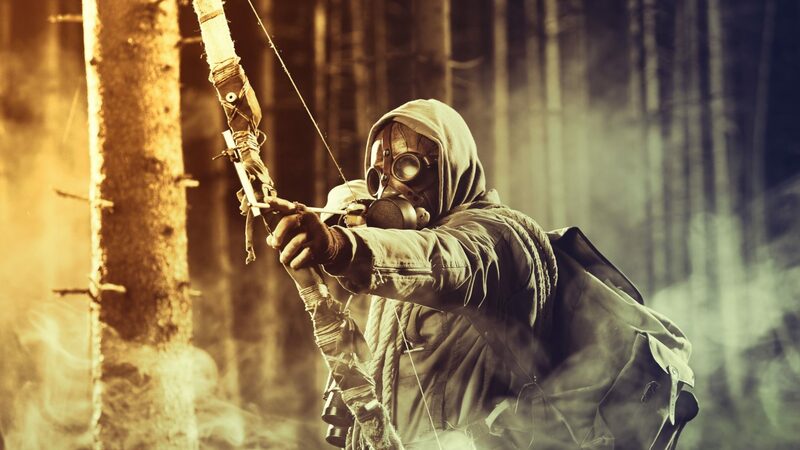 Great for blocking sun and other elements you’re likely to encounter on the range or backpacking through the Appalachian Trail. May be a little warm during the summer heat, but you’ll adapt. 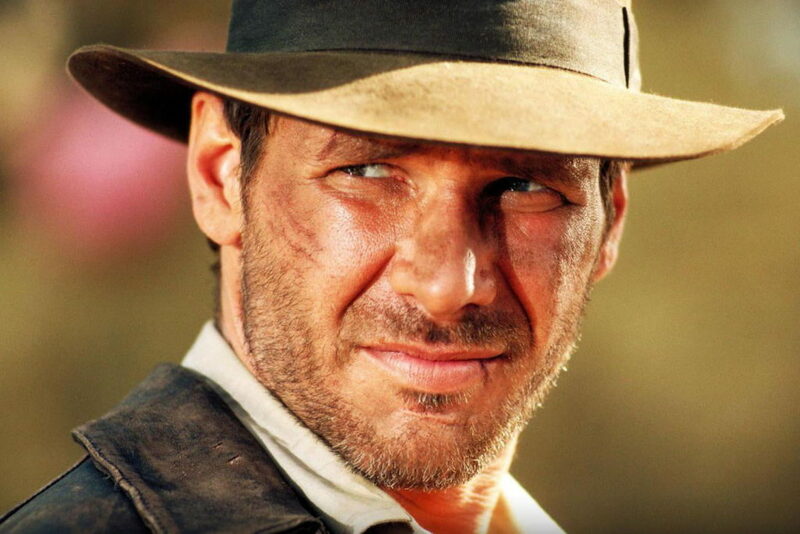 No list of iconic hats would be complete without an Indiana Jones look-a-like! Okay, so it’s not the same hat from the movie, nor is it the same quality, but it’s a cheap alternative for those who want something that looks similar. This particular outdoorsman hat is similar to others of the same type; 100% wool felt, crushable and water repellant. 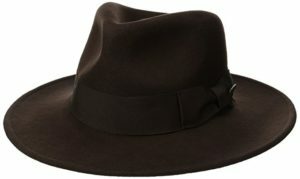 This is not a true fedora, it’s more of an outback style outdoorsman hat. Waterproof and breathable from 100% cotton, this outdoorsman hat has a nice profile. Protecting you from sun, rain and snow while styling! The brim is stiff and larger than most outdoorsman hats I’ve worn, but the wire in the brim enables you to shape it how you want. It comes with a chin strap to keep the wind from taking it. These things come waterproofed, but you can add another light coat of oilskin dressing to go a step further. 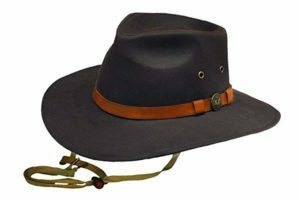 This outdoorsman hat is great for hunting and backpacking. Another great hat by Outback Trading! These are different from the usual wool felt hats I normally recommend, but they are great for different climates. These are made from cotton and have UPF protection, a 4” crown and a 2 and ¾” brim. Perfect for hiking, backpacking, hunting or just lounging around the camp smoking cigars. 100% wool, 3” brim, sophisticated style, crushable/packable – this is the hat you’re looking for! Did I mention it’s water-repellent? This crushable outdoorsman hat works well in cool and warm weather. A favorite among outdoorsmen; quality at a low price. I’ll admit, I’m not a big fan of the feather, but it does add a little something extra. One thing I will mention is if you opt for the olive green color, be ready for some discrepancies on tone. The manufacturer makes at least two different shades of olive, so you could get either one. Great trail hat! It does have a curved brim, so make sure that’s the style you’re wanting. Lightweight and made from 100% wool, you can jam this in your pack and it will retain its shape. Smaller brim than other outdoorsman hats, it also comes with a moisture-wicking headband for warmer climates. Wool-felt and water repellent. This outdoorsman hat has a UPF rating of 50 which is great for those of us in warm climates that spent a great deal of time in the sun. The Montana hat retains its shape, so you can stuff it in a pack and pull it out later. I don’t recommend this, you should take better care of your hats, but they will retain their shape fairly well. 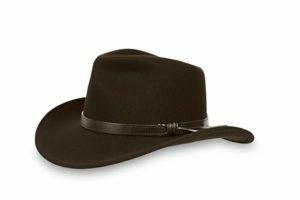 The 3” western-style brim gives this hat a nice look. Another great entry by Scala! 100% wool and ready to take on the trail or sip coffee at the camp before a big hunt. Water-repellent and crushable. Notice the trend here in weather resistant and packable? It’s a good idea to purchase a hat that can stand the elements instead of one that you have to be careful with. 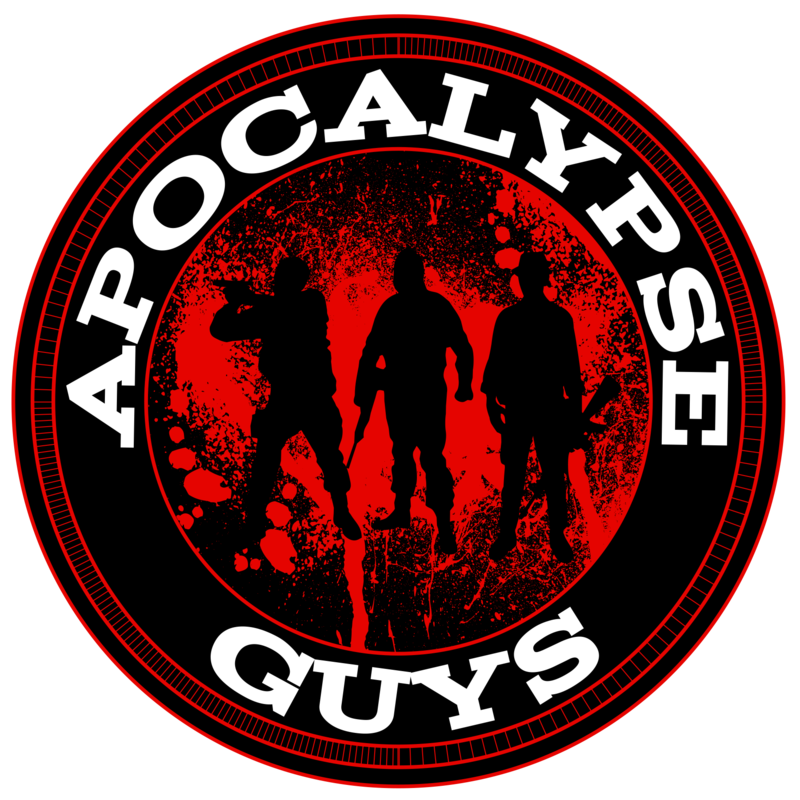 We know most of our readers here at ApocalypseGuys.com are the adventurous type and need rugged gear. That’s why we do what we do. 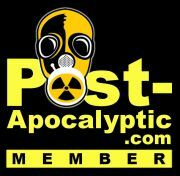 We love great gear as much as you and do everything we can to seek out the best gear and tell you about it. Have a gear suggestion? Leave us a note in the comments!